Description: Mica Washer is used for thermal & electrical insulation. This product have low thermal expansion, low thermal conductivity & withstand very high dielectric strength & high temperature and also have good mechanical strength before and after machining. Keeping the variegated requirements of our clients in mind, we are specialized in offering a premium quality range of Mica Washer. This Mica Washer is manufactured utilizing best quality mica and latest machinery. Besides, these products are available in numerous sizes to meet the requirements of our clients. We have carved niche amongst prominent dealers of wide assortment of Mica Washer. These are highly recommended amongst the customers for their low thermal expansion and optimum quality. We source them from leading manufactures of the market. Our offered products find application in electronics, electrical and many more items. Mica washers are circular punched natural mica parts with round openings in the center suitable for electrical and electronic applications. Such natural mica washers can also be bonded into considerable lengths with epoxy or silicone binders to form a solid roll which is called bonded mica washers. Our transistor bushes are made from clear NYLON with permissible temperature of 120 Deg.C..
Bushing are of two types i.e. Heatsink Bushing & Transistor Bushing. Transistor Bushing are of two types i.e. Std. with height 4.7mm and Extra long with height 7.5mm. 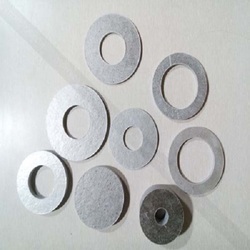 We offer our client an excellent quality range of Mica Washers, these are circular punched and stamped natural mica parts with round openings in the center suitable for electrical and electronic applications. These are precision engineered, designed and developed to meet the requirement of several industrial establishments. 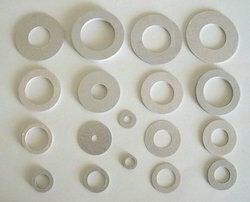 Natural Mica Washers are circular punched and stamped natural mica parts with round openings in the center suitable for electrical and electronic applications. Mica washers are mica dics of inferior quality with round opening in the centre, which can be bonded by shellac or epoxy into considerable lengths. Maximum use is in railways. These are mica discs of inferior quality with round opening in the centre, which can be bonded by shellac or epoxy into considerable lengths. Maximum use is in railways. In order to keep pace with never ending demands of the customers, our company is instrumental in offering Mica Washer. Available in different diameters, these Mica Washer are hard in nature and completely safe to use. These mica washers are rust proof and can be available from us in many patterns. Made in high accuracy, these washers are finely prepared with the use of highly ductile metal that is safe from damage by pressure. These are mica discs of inferior quality with round opening in the center, which can be bonded by shellac or epoxy into considerable lengths. Maximum use is in railways.